After spending a nearly 2 weeks in Kazakhstan and Korea, where we came up completely empty-handed on the McDonald's front, we flew down to Okinawa Japan for a short pre-Christmas holiday before heading back to Singapore. 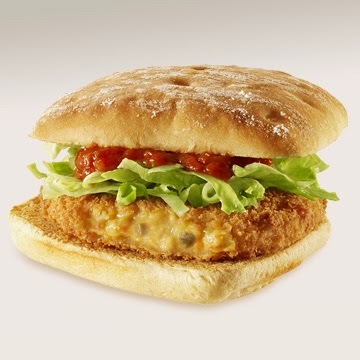 In November, a colleague of mine flew down the Gracoro, and Demi-Glace Gracoro from Japan for me to review, and I was lucky enough to catch their replacement, the Crab Croquette Burger! Although we only going to be in Japan for a single day, and by 9pm, we had already eaten the equivalent of 4 big meals of worth of food throughout the day, I still made the effort to go into McDonald's and order this burger as we were leaving the following morning. I skipped the combo entirely, and used a coupon available on their website to get the burger for the discounted price of 350JPY, a bargain compared to what I pay in Singapore for promo burgers these days. Japan being an expensive destination, and coupled with using ingredients like crab AND lobster, I was very impressed at the price point. Although the price was a bargain, the burger was also respectable size, it wasn't massive, but it was larger than the value burgers you'd usually get a McDonald's, about the same diameter of a Big Mac. When I opened the wrapper (no promo box this time), the ciabatta bun looked decent enough, and it was sufficiently soft. But the only scent coming from the burger was from the tomato sauce which topped the patty. I knew there were mushrooms in the patty, so I let my wife take the first bite (not that I usually have a choice), so she could warn me if it was going to be too 'mushroomy' for me (long time readers know, I despise mushrooms). Luckily there were only a handful of very small slivers mixed in the patty, so I thought I'd be able to stomach them for the sake of this review. I had scoped out the website prior to my visit, but I guess I didn't really take a close look at the promotional photos they used, as I was rather surprised by the creamy filling. I had expected it to be at least semi-firm like the recent croquette burgers I had in Japan, but this certainly was a full cream centre. Google Translate of the website tells me the filling is made of diced red snow crab and mushrooms, which are 'stewed' in a soup of lobster shells. The filling certainly was fishy but it didn't have any distinct flavours of crab to me at least - my wife said it reminded her or Crab Paste, which although I've had before, I probably wouldn't make that same comparison. I picked out a couple crab pieces to try them on their own, and they didn't really have any flavour and they were also a bit on the chewy side, but you couldn't notice that when it was in the filling. On it's own, the filling would have been fine, but what really turned me off this burger was the crispy shell that surrounded it. Although this looked like a regular fried-burger breading, it was at least twice as thick as a standard McDonald's breading. I assume this was so no filling could leak out during the frying process, but this resulted in a noticeable crunch that came with each bite. 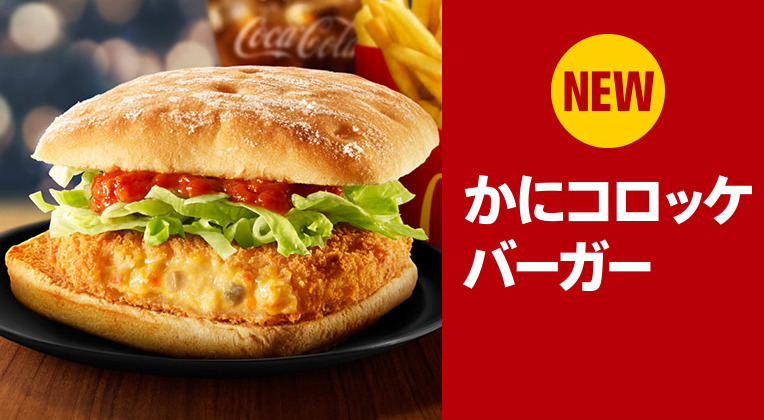 The combination of the crunchy shell, and not-that-tasty-creamy filling resulted in probably the worst McDonald's burger I've ever had from Japan. Even the premium bread, and the new 'chunky' tomato sauce couldn't this burger. If the sauce would have some herbs and spices to it, almost like a marinara sauce, it would have complimented that crispy shell a bit better. Yes, the sauce was chunky, but it was overly sweet, and too close to ketchup for me. But hey, I did compliment the burger with this tasty bottle of Orange Coke. That was surprisingly good! I regret not buying a couple more bottles to bring back to Singapore.